A celebratory festival of all water-based activities is the perfect opportunity to find out about the affordable alternative to powerboat ownership – the Seawake boating club. Seawake is a business based in Menai Bridge and Felinheli, a member of The Absolutely Group. 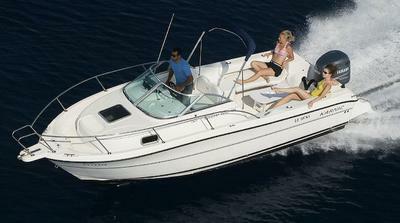 Mallorca, the French Riviera and the UK’s rugged coastline can all be explored in a Seawake-provided boat. Members have access to bases in Europe (Antibes, Palma), England (Lymington, Poole), and Wales (Conwy, Menai Straits and Pwllheli). Sailing enthusiasts will be visiting the All Wales Boat Show in Conwy, on July 24 to 28, 2013. Information about the Seawake holiday experience is available from the Seawake team at 01248 716335, or info(at)seawake(dot)co(dot)uk. "With Bronze, Silver and Gold membership packages, Seawake provides everything for the best possible boating holiday experience," explained Duncan Gilroy, Seawake Managing Director. "We know that boat ownership can be expensive and time-consuming. A Seawake member simply books the boat in advance for a selected number of days, has the pleasure of using it, and then leaves it with our Site Manager at the end of the agreed time. We take care of everything else, including RYA land- and water-based power boat training." He added: "Seawake’s fleet of boats, our RYA-approved courses, and our flexible membership plans add up to a wonderful, and safe water holiday experience. For example, a member can book up to six months in advance. Bookings on the actual day of use are no problem either – we need less than 30 minutes to get the boat on the water. At Seawake, we’re all about experiencing the pleasure of safe powerboat and yachting experiences." The All Wales Boat Show incorporates the Conwy River Festival, which celebrates its 20th anniversary this year, and provides traditional racing and up to 70 on-the-water displays.